From time to time, I receive an e-mail from the system administrator telling me that I will have to change my password for the company network to get further access to it. Usually, I wait until the system won't let me in with my old password – but that's another story. 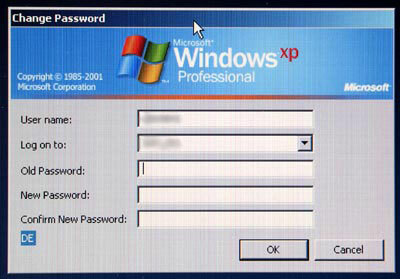 Some time ago, the rules for passwords were tightened. A simple string of letters no longer suffices as a password. Because of their complexity, passwords obeying the new rules require my full concentration when I enter them. I'm usually not able to enter my password when someone stands beside me, talks to me, and, particularly, expects an answer from me – which interestingly happens quite often. As a password remains valid for quite a while, my arms and fingers gradually learn the movements that are needed for entering it: More and more, this process becomes "automated" – at least for the final characters. When I had to change my password recently, this "subconscious" learning had fatal consequences for me. Whenever the dialog for changing the password comes up, you have to enter your old password first and then the new one twice (see figure 1). I did so, or at least, I believed that I had done so – but only until I tested my new password, logged off, and tried to log on again. The new password simply did not work! Finally, I had THE idea: What if I entered the last letter of my previous password as the last letter? I did so – and, oh wonder – was able to log on to the system. Thus, my arms and fingers had automated the process of entering my previous password so much that I entered the wrong last letter twice without even noticing it! Wow! That reminds somewhat of automatically hitting the Enter key for the destructive option of a popup. In the worst case, this popup asks whether you want to format your hard disk – which I "successfully" did years ago in spite of two(!) warning popups.